THE TOP 10 SUNDAY TIMES BESTSELLER 'Completely fascinating, authoritative and intriguing' William Boyd 'The big bang of Bond books... Beautiful, brilliant' Tony Parsons Goldeneye: the story of Ian Fleming in Jamaica and the creation of British national icon, James Bond. From 1946 until the end of his life, Ian Fleming lived for two months of every year at Goldeneye - the house he built on a point of high land overlooking a small white sand beach on Jamaica's north coast. All the James Bond novels and stories were written here. Fleming adored the Jamaica he had discovered, at the time an imperial backwater that seemed unchanged from the glory days of the empire. Amid its stunning natural beauty, the austerity and decline of post-war Britain could be forgotten. For Fleming, Jamaica offered the perfect mixture of British old-fashioned conservatism and imperial values, alongside the dangerous and sensual: the same curious combination that made his novels so appealing, and successful. The spirit of the island - its exotic beauty, its unpredictability, its melancholy, its love of exaggeration and gothic melodrama - infuses his writing. Fleming threw himself into the island's hedonistic Jet Set party scene: Hollywood giants, and the cream of British aristocracy, the theatre, literary society and the secret services spent their time here drinking and bed-hopping. But while the whites partied, Jamaican blacks were rising up to demand respect and self-government. And as the imperial hero James Bond - projecting British power across the world - became ever more anachronistic and fantastical, so his popularity soared. 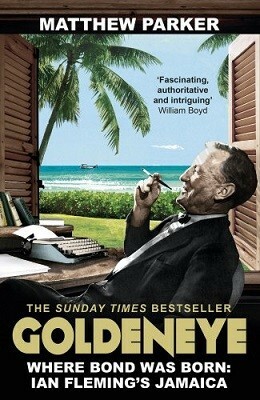 Drawing on extensive interviews with Ian's family, his Jamaican lover Blanche Blackwell and many other islanders, Goldeneye is a beautifully written, revealing and original exploration of a crucially important part of Ian Fleming's life and work.